Brandy Scott-Herman, a career coach supervisor at OhioMeansJobs, just won a Hamilton County Circle of Excellence award for Outstanding Service. 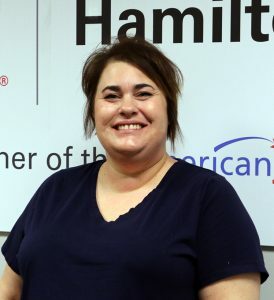 “Brandy Scott-Herman guided and grew a program in 2019 that literally helped thousands of Hamilton County residents to a better place in life. This is what one resident wrote after Scott-Herman’s Prevention, Retention and Contingency (PRC) program helped her with car repairs – allowing her to take on more work hours. This is just one of thousands helped by the PRC program, which helps Hamilton County residents stay out of the public assistance program (Prevention), obtain or keep a job (Retention) or address a one-time emergency need (Contingency). Scott-Herman led efforts to help pregnant and new mothers obtain car seats or breast pumps, homeless families secure beds and other furniture when they leave shelter, would-be nurses afford tuition and transportation assistance so they can follow their dreams, struggling families pay rent or utilities so they don’t end up homeless, and, of course, worried employees who need car repairs or other job supports to stay employed or increase their employment opportunities. Other winners: Brad Miller, assistant director of Environmental Services, for professional achievement; Mary Sticklen, a business specialist with Environmental Services for Rookie of the Year; Probation Officer Shannon Thompson, County Hero; and for Team Impact – John Nelson, Joy Landry, Michelle Balz, Susan Schumacher and Brad Johnson with the Soil & Water Conservation District.